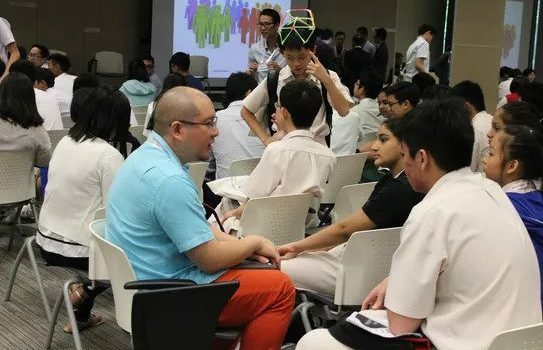 27 January 2018, Singapore – Ask a teenager in the 90’s what they would like to be in the future and the answer would probably be a career as a professional, climbing up the corporate ladder. But ask a teenager now the same question and the answer is much more varied – what with trailblazers like Steve Jobs and Elon Musk inspiring a new generation of innovators and entrepreneurs to tackle future needs and not-yet-created industries. To usher in this new era of leading edge risk-takers, Prudential Singapore has collaborated with Acorn Training and Schmeet Pte Ltd to inaugurate the freshly minted Prudential Young Trailblazers, an innovation and entrepreneurship competition empowering participants to solve authentic business problems in creative and groundbreaking ways. The competition currently boasts a robust participant base of approximately 200 students from both the secondary and tertiary levels who are guided by dedicated trainers and industry-specific mentors. Teams will collaborate to complete tasks that anchor a comprehensive online curriculum combining elements of design thinking with commercialization processes so that students can develop and apply the full spectrum of skills needed to become a Young Trailblazer. Developed by Acorn Training and supported by Schmeet’s pedagogical principles, the curriculum aims to enhance participants’ competencies ‘Beyond Academics’ through progressive scaffolding and experiential learning. Mr Wilf Blackburn, CEO of Prudential Singapore, was also in attendance. He notably mentioned the need to spark innovation at a young and impressionable age so that youth can be better equipped to deal with the uncertainties of the future. No longer is ‘I’ in IQ that of Intelligence – it is much more important now for youths to have a high ‘Innovation Quotient’ that empowers them to adapt to and overcome future challenges. Citing examples from the company’s very own Ignite innovation competition and fintech applications, Mr Blackburn affirmed the importance of the curious, fresh and open perspectives of youth and Prudential’s support in implementing their innovative and commercially viable solutions. 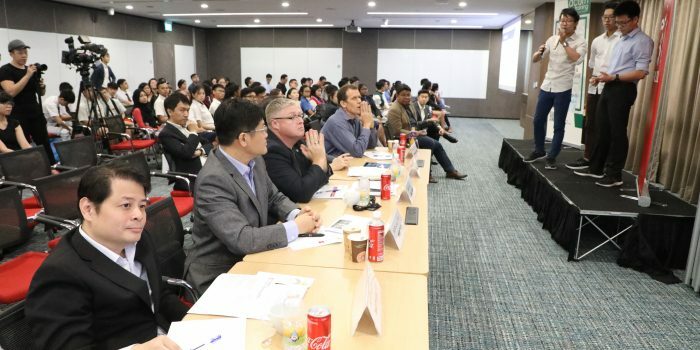 Echoing Education Minister Ng Chee Meng’s need for the 3’I’s: Imagination, Inquisitiveness and Interconnectedness, Mr Blackburn also paid homage to the spirit of entrepreneurial dare that the competition aims to inculcate. This was then reinforced by the eye-opening panel discussion on “Innovation and Entrepreneurship in the Age of Disruption”. Moderated by event co-organiser Nur Iskandar, CEO of edtech start-up Schmeet Pte Ltd, the discussion was anchored by Prudential Chief Innovation Officer Arvind Mathur, entrepreneurship guru Fred Then, financial planning extraordinaire Steven Ong and edtech expert Soh Chong Kian. Citing their unique and inspiring experiences in failing forward and being fearless in executing innovative solutions, the panelists reminisced about their multiple non-successes that eventually became the steps charting their way towards eventual breakthroughs. In fact, Mr Fred Then endearingly labels these failures as “tries”, since they were the means through which he eventually succeeded. In addition to de-stigmatizing failure in this manner, Mr Then also asserted that “early failures are cheap” and encouraged all participants to start cultivating their entrepreneurial dare at a young age. Prudential CIO Mr Mathur also highlighted the importance of “incremental innovations” – small changes that have just as much disruptive impact as big ones, since they possess the potential to evolve to something much bigger in the future. Participants also had the privilege to undergo a workshop on “Innovating Human-Centred Solutions” conducted by Acorn Training in order to get them on the right footing. When asked about their feelings and expectations of the competition, Westwood Secondary School students Yang Bo Jie and Tee Jia Hong enthused about wanting to expand and improve their skill sets early and cited aspirations to open their own business while at the same time contributing to society. The same sentiments were echoed by a team of Business Adminstration students from Singapore Polytechnic who described the competition as a safe place for them to test their business acumen. All in all, the competition looks set to be a thrilling and productive one that not only nurtures the entrepreneurial spirit that is so essential in these unpredictable times, but also builds productive networks between today’s innovators and tomorrow’s leaders. 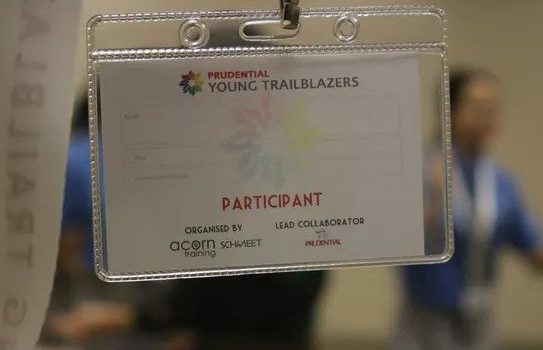 Prudential Young Trailblazers is an innovation and entrepreneurship competition co-organised by Acorn Training and Schmeet Pte Ltd in collaboration with Prudential Singapore. Acorn Training Pte Ltd is a leading training consultancy specializing in leadership development, design thinking and experiential learning workshops, while Schmeet Pte Ltd is an educational technology solutions provider that customizes curriculums and programmes in line with the latest educational trends, pedagogy and andragogy. Prudential Singapore is one of the top life insurance companies serving the financial security needs of Singaporeans for over 85 years. Visit www.youngtrailblazers.net for the latest updates on the competition.